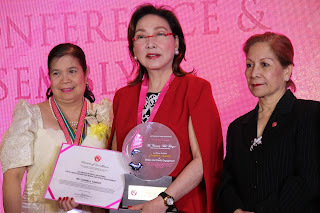 GMA News Pillar and multi-awarded broadcast journalist Mel Tiangco was conferred the “Las Damas de Rizal Excellence Award for Women in Media and Public Engagement” by the Las Damas de Rizal-Philippines last August 6. The veteran broadcast journalist has been with GMA Network for the past 21 years and is the founder and ambassador of GMA’s socio-civic arm GMA Kapuso Foundation. She is seen on television everyday via GMA’s flagship newscast 24 Oras where she is one of the anchors. During Saturdays, she hosts the award-winning drama anthology Magpakailanman. This is the first time Las Damas de Rizal is giving out awards to select Filipinas who have shown notable work in their respective industries. Other award categories included: Women in Government and Public Administration, Women in Advocacies, Women in Global Arena, Women in Business and Economics, Women in Cultural Heritage Conservation, Women and Family, Women and Environment, and Women and Philippine Cinema.